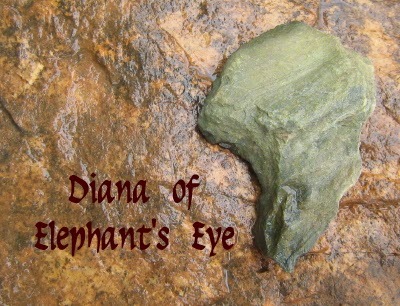 We wait patiently for the right buyer to come for Elephant's Eye. Chocolat demonstrates at Spirulino's that patience is an uncomfortable virtue as we are poised in limbo. 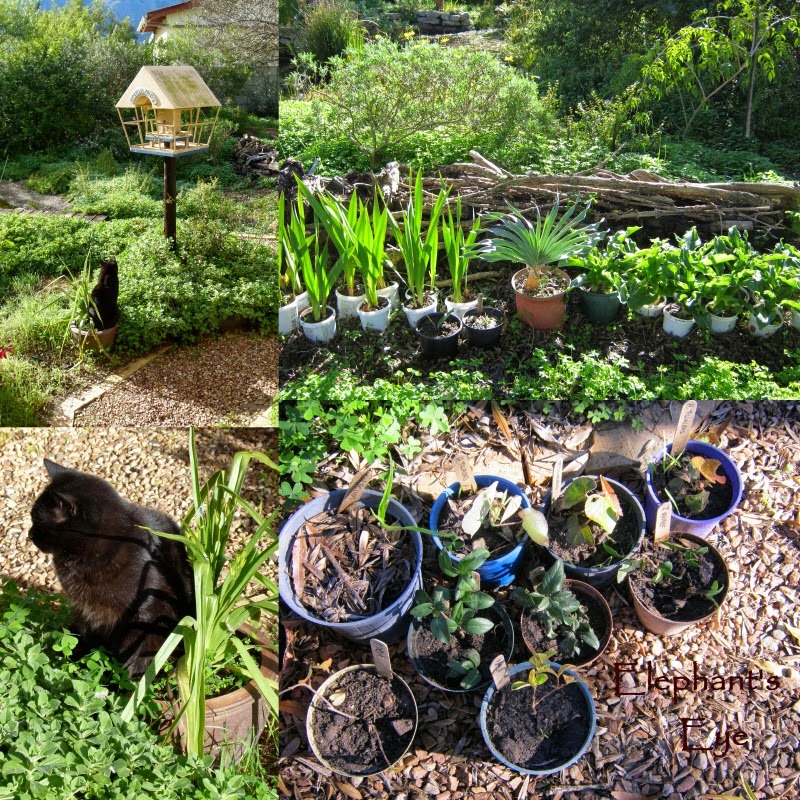 When the Ungardener has fed the birds, and all is ominously quiet instead of our usual white noise of birdsong, he finds Chocolat and explains - 'IN! It's the birds turn to eat now' I've potted Watsonia, Veltheimia, Boophane and Brunsvigia bulbs. The rescued wild orchid. Fresh cuttings of Hibiscus tiliaceus, Japanese flowering quince and Pride of India with its beautiful flaking cinnamon bark - since the first lot didn't take. Chocolat waiting. Lizard or bird, he doesn't mind. But we do! Beneath the bare ash trees the low winter sun shafts in and catches the fresh green fans of Chasmanthe leaves. In the planters on either side of the central path Lachenalia rubida is flowering for the winter solstice. 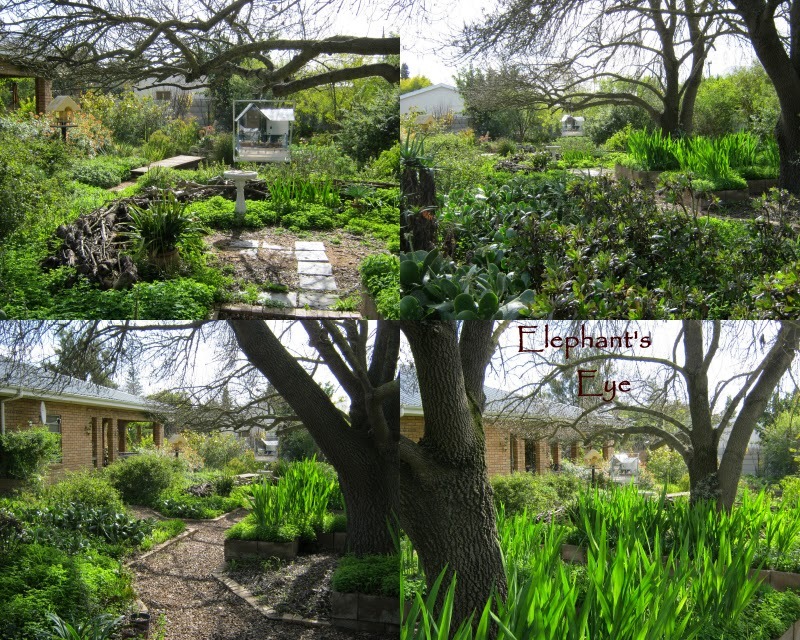 One lady, who came to view the house with a friend, looked around and said there's hope for my (Porterville) garden yet! Strange - if her garden isn't happy in our kind wet weather? First impression here is the apricot Tecoma which waves between the balustrade of the verandah and Ungardening Pond. Sadly someone has hacked back the Tecoma in our new garden and there are NO flowers there. I'm getting a second set of flowers, since I dead-head most weeks, and prune with obsessive care. I HATE plants that look hacked off! 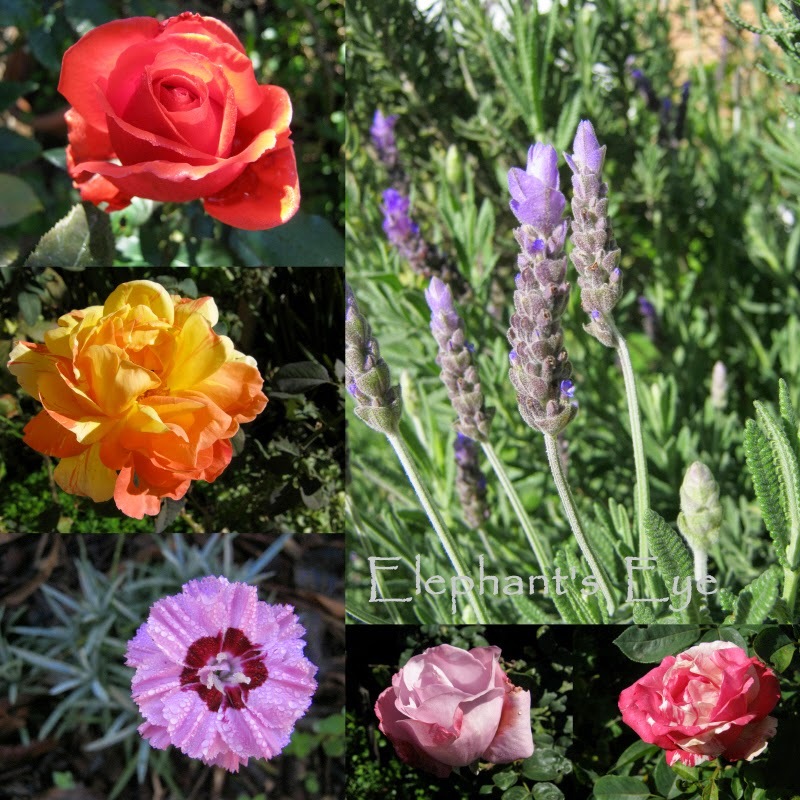 In June foreign, exotic, commonorgarden flowers are lavender (in sheaves for the vase as I keep paths open), the first Dianthus, with roses - Duftwolke, Tropical Sunset, Burning Sky, and Chaim Soutine. 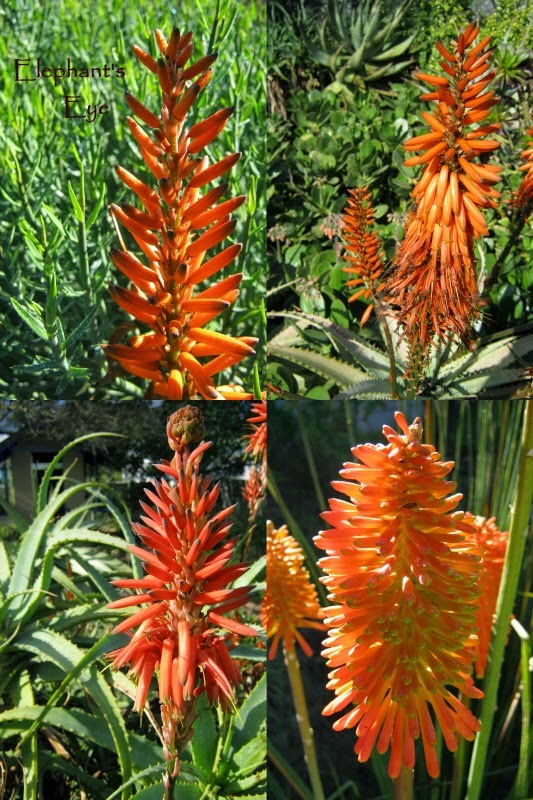 Winter is welcomed by aloes with their red spires blazing, and the Kniphofia which grows happily with wet feet in Plum Creek. Near Hibiscus tiliaceus another plant which expects to enjoy wet! Among my potted bulbs Lachenalia rubida with its large lush leaves and ruby red flowers is popping up where it was invited, and where it has self seeded with enthusiasm. Port St John's creeper needs an arch to climb over. 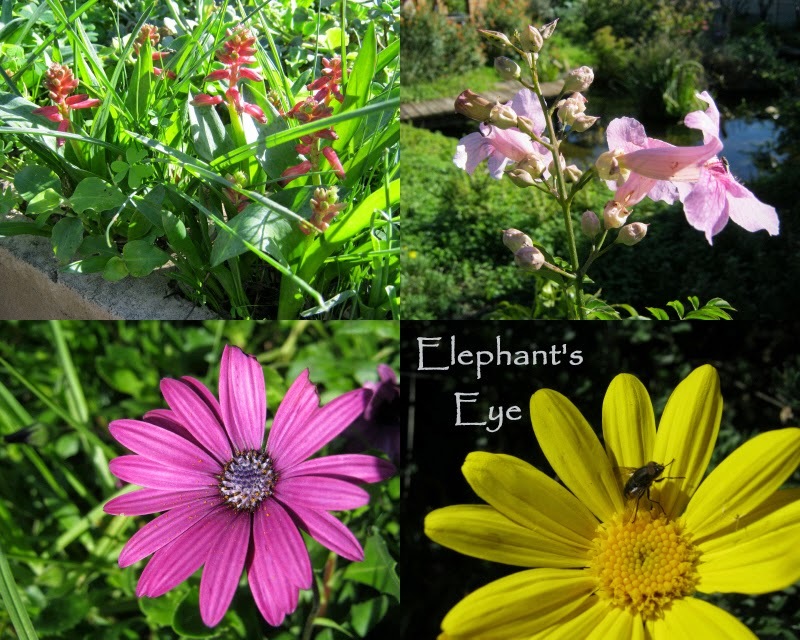 Bright yellow Euryops echoes the sunshine, dark purple Dimorphotheca adds deeper grace notes to spark the green. 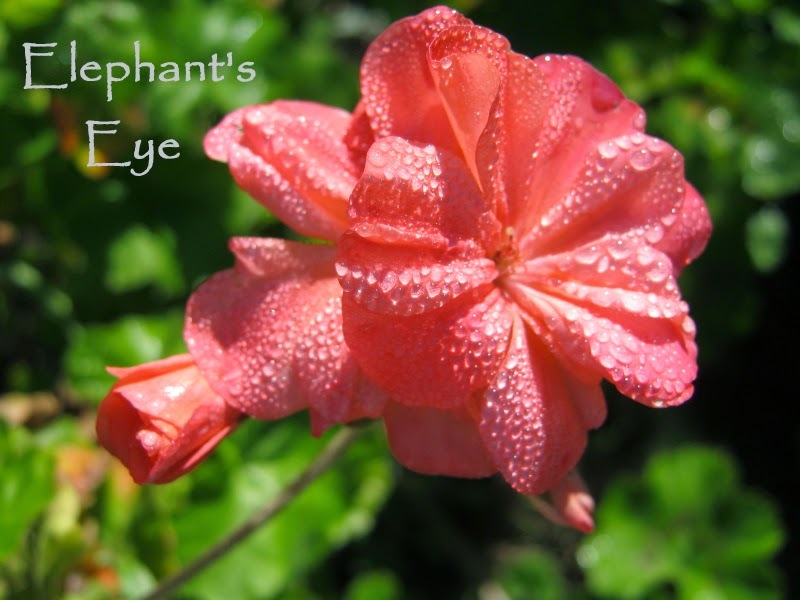 Morning photos capture dew on furry leaves and salmon Pelargonium petals for Wildflower Wednesday with Gail at Clay and Limestone in Tennessee. It's heart-wrenching leaving behind a garden that has been so much work and thought, I hope your hacked Tecoma pops back soon. So many of your plants are exotic and only live in the south US, at least I can grow Dianthus! I love the tropical plants, so I enjoy seeing yours that I can't grow. the Tecoma will be quite happy, once they stop hacking ... I can haz flowers?! Beautiful blooms. I love that intricately woven start to the bird nest. Amazing. Lorraine, you would enjoy watching him carefully threading his needle, weaving in and out, then tying off with a neat and strong knot. You certainly used you magic to turn your garden into a wonderful place. Must be hard to leave it - but I'm sure you can wave you magic wand again! It was a lovely visit.... the weaver was perfectly captured! I really like the weavers and how they make their nests....fascinating really with so many birds and their weaving skills....your apricot Tecoma reminds me of hummingbird mint here.....patience-not something I am good at but I do hope thew perfect homebuyer finds your incredible home and garden soon! Those weaver birds are amazing. I watched this video http://www.youtube.com/watch?v=6svAIgEnFvw and I am in awe. sometimes I find just the first knot on a branch. A practice knot. 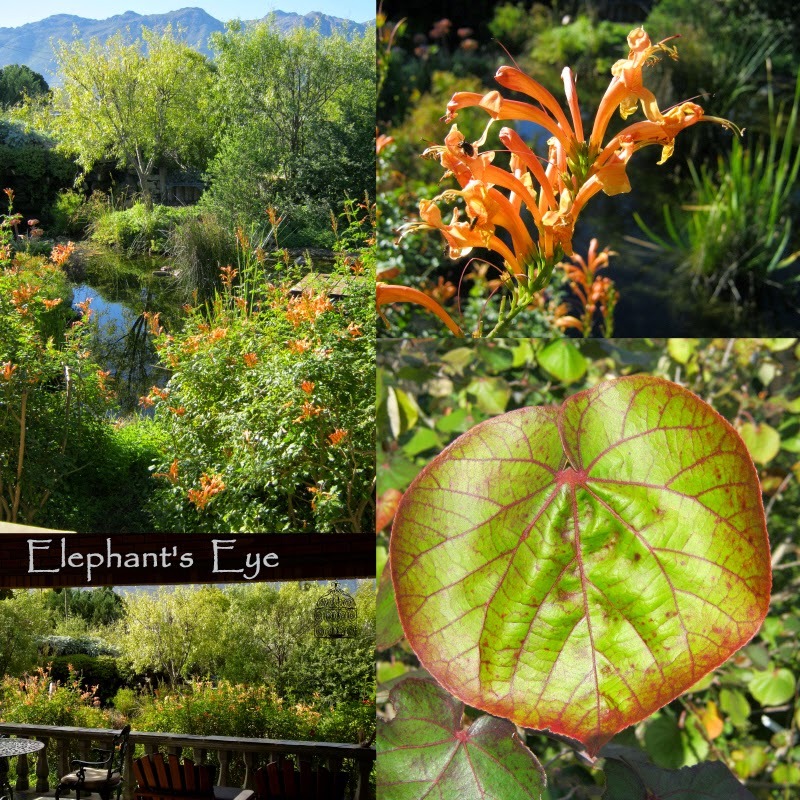 Beautiful gardens, loving those colors Diana. Leaving a garden is so hard, I find it harder than leaving a house. 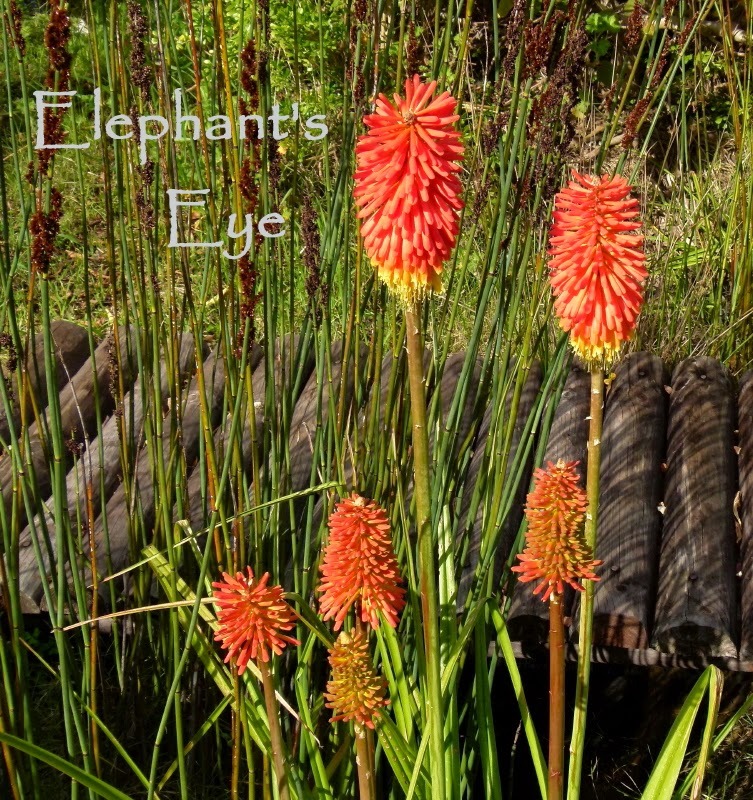 Your gardens are so lovely, with such a variety of plants. 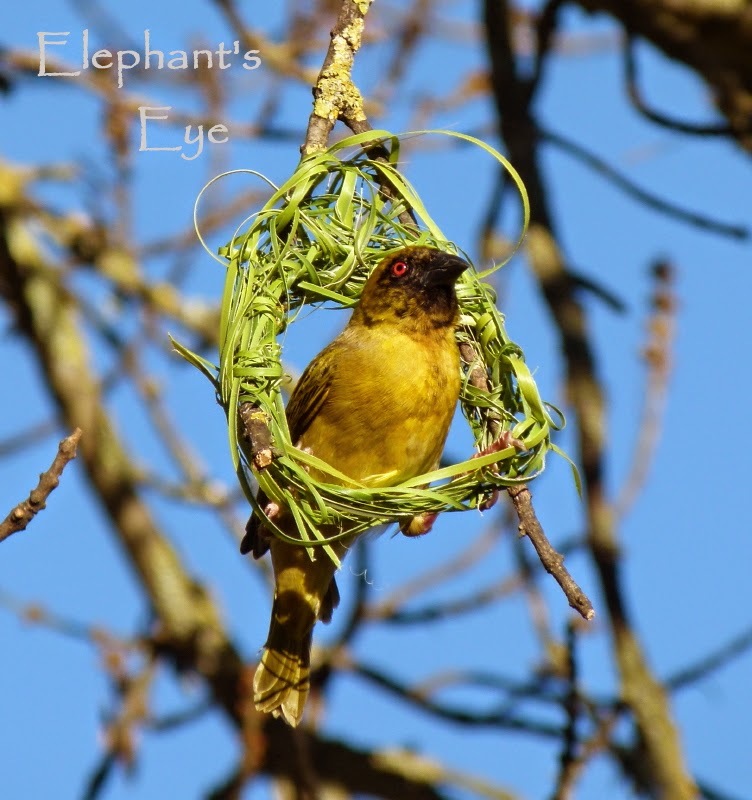 Fascinating shot of the weaver bird, it looks such an intricate process.